Hey, first time posting. Thanks in advance for any help. I really need it. Dell's customer service acted like they would help me and didn't after I spent literal hours proving there were issues with my model in a remote session and over the phone. I was offered only the answer, "There's nothing wrong with your computer". After I got really upset, they sent out a technician who hardly did anything. Really disappointed in the company this time. Upon removing my motherboard, I saw the exploded capacitor (at least I'm pretty sure that's what it is) pictured here. I need to replace it obviously. I cleaned the electrolytic discharge and put the computer back together for now. in case you couldn't see it. That's also happens to be the model number of an electric razor. That makes this really hard to research, and I'm grasping at straws now. Please, anyone that can help, I'd really appreciate your help. This really ***; having spent 1700 dollars on a high end computer, this problem is physically sickening. Most boards these days don't use electrolytic caps - particularly with notebook boards. All the other devices around this one are solid-state thin film resistors. 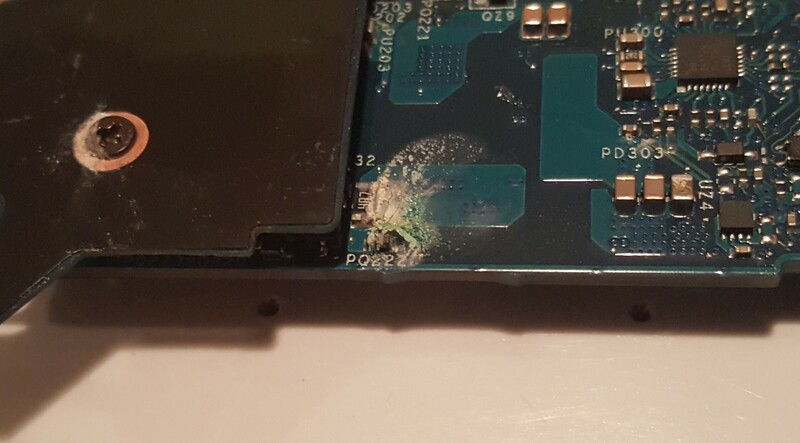 It looks more like some sort of dried liquid spill on the board -- particularly given the same substance on the screw by the area in question. If it was a capacitor, it would be a solid state one -- not electrolytic. It's not clear what the "Abnormal" behavior was, but try cleaning up the debris completely. If that doesn't solve whatever problem you were having (such as a no-power-up), it's very likely you'll need a mainboard replacement to solve it. Thanks so much for the detailed answer. I sincerely appreciate you. Do you know if there's a way to find out the specs on that resistor? I stated in my original question that I cleaned up the fluid before I reassembled the computer. I'm still having my original issues. While I agree that it looks like dried liquid, I would question how that's possible. There's the keyboard and the case before you get to the problem location. I had to remove the board and turn it upside down to find the damage. Wouldn't other components appear damaged as well? The computer almost never leaves my side either. It would be hard for someone to spill liquid on the laptop without letting me know. Also, if it matters, I bought it refurbished from Dell's Amazon store, not from a third party. If you're interested in the specifics behind the abnormal behavior, it seems to deal with the wireless connection. Almost every time I sleep the computer, I get a "Secured, no internet" descriptor under my network SSID in addition to having no internet access. I tried it on different access points, 2.4 and 5ghz frequencies. I tried completely reinstalling windows. I tried booting into various distros of Linux and experienced packet loss which is proof that software is not the issue. I even tried replacing the stock Killer Wireless 1535 card with an Intel 8265 WLAN. Same behavior. Other wireless devices on the same networks don't show any issues. The reason I didn't detail my problems originally is because the cause of the issue is obvious from the image and I was trying to keep it as short as I could. If you could give me any specs on that transistor, I would be eternally grateful. I've accepted that I won't receive any direct assistance, and I can't fathom spending 500 more dollars on a replacement board when this thing is so new and I know what's causing my problem. Please, anything you can tell me about that transistor would help me so much. Even if you could put me in touch with someone who knows, I'd be willing to go through the proper channels to figure this out.